It’s a very special week. It’s certainly special in the life of The Church but actually, it’s special for every single person who has ever walked the earth. This is the week that makes all the difference for us…it’s the week when we remember that Jesus died for every one of us, as it says in that very familiar Bible verse, John 3:16. It’s more than a sign you see at sporting events…it’s God’s Truth to us, fulfilling His promise of sending a sacrifice to redeem us. Redemption. It’s ours, free and clear. All we have to do is accept it. That’s why we are excited…that’s why Christians all over the world are hijacking your Twitter, Instagram and Facebook feeds. It’s because we have experienced redemption and love in the very truest sense and more than anything, we want to share that with you. This is Easter. This is redemption. This is freedom. This is God’s love, come to earth in the form of His Son to redeem us. But, that isn’t the end of the story…. We are going to celebrate this redemption in some special ways at MPCC and we hope you will consider joining us. 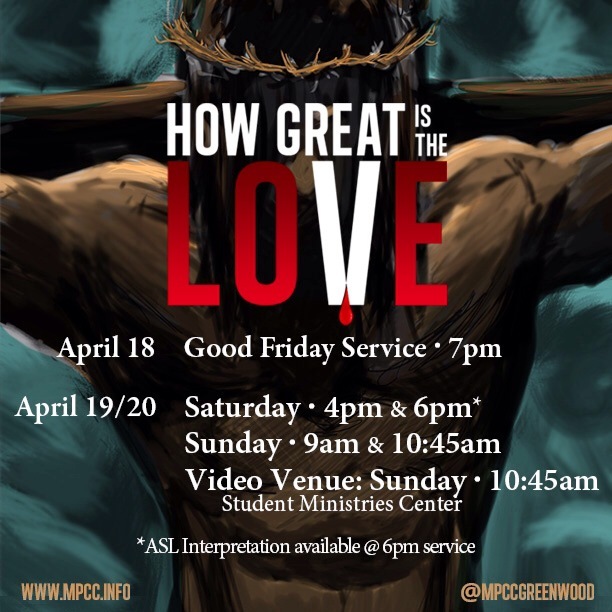 On Friday, April 18th at 7pm we will gather for a very special Good Friday service. This gather will focus completely on the cross as we reflect and remember the ultimate sacrifice that Jesus made for us. Then, on Saturday, April 19th at 4pm & 6pm and Sunday, April 20th at 9am & 10:45am we will gather again for a blowout celebration! I mentioned earlier that Friday isn’t the end of the story. Jesus Rose From The Dead! On Saturday and Sunday, we will celebrate, give thanks and worship Him for who He is and all that He has done for us.